Summertime at Haymeadow is gorgeous! And June is a great month to get outdoors! 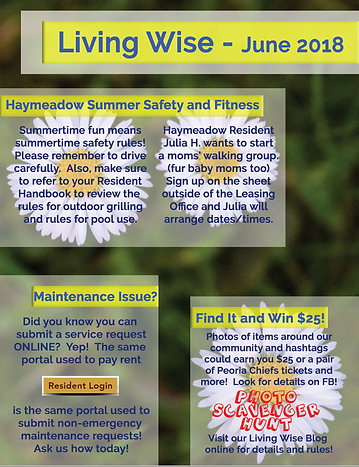 In this June 2018 issue of Living Wise we have safety reminders, plus one our tenants wants to organize a moms&apos; walking group! Finally, if you like posting photos on social media, we have a fun little photo scavenger hunt with prizes for 1st, 2nd, and 3rd place. Julia H is inviting you on a morning or evening walk! 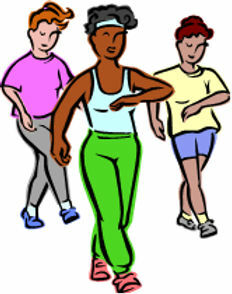 A moms&apos; walking group! (great idea) Of course, dads and fur babies welcome too. If you have an interest there is a sign-up sheet outside of the leasing office on the message board. Speaking of message board. A photo of the message board is one of the items on our Photo Scavenger Hunt! 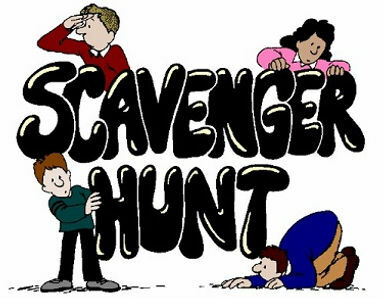 Take a pic, post the pic to social media, use hashtags #scavengerhunt #peoria and tag @HaymeadowApts. Pretty easy! Click here to visit the Rules page for the complete list, and start and start posting pics! Don&apos;t forget to observe rules for pool use and grilling as outlined in your Resident&apos;s Handbook. Enjoy the summer everyone! Thank you for reading and sharing!